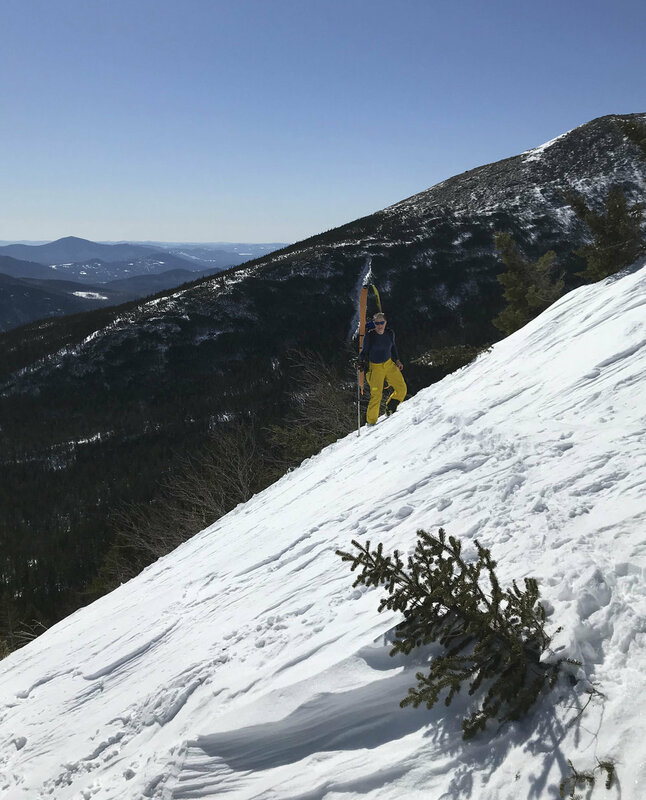 Northeast Vertical: A blog about skimo, backcountry skiing and running in the Northeast. 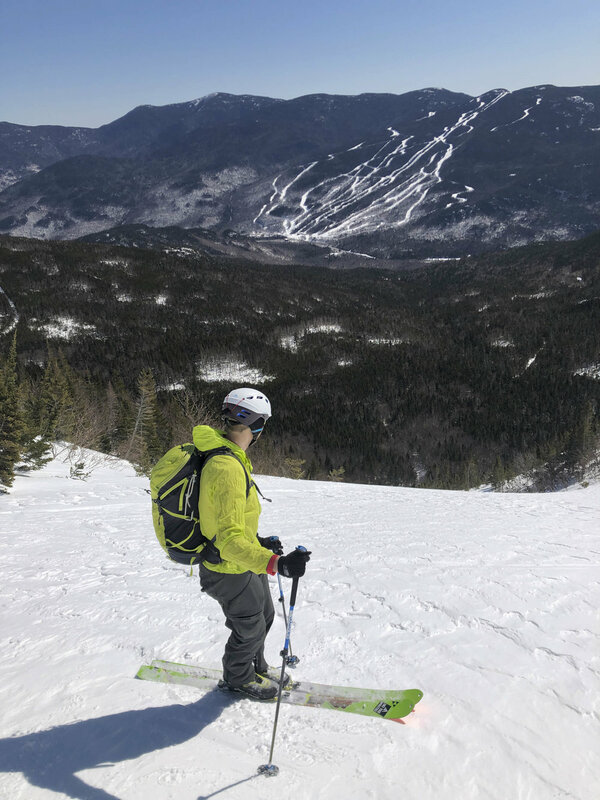 Conditions were right yesterday for skiing some of the steeper lines in Tuckerman Ravine. Warm temperatures overnight and skies clearing throughout the day made for the first real spring skiing conditions I’ve been able to get since December. Alex looking very fashionable with his matching boot/pant combo while setting the booter up Left Gully. Andy and I arrived at Pinkham, thinking we were very early, to a horde of people clogging up the lot. The Tuckerman Inferno was running and spectators and racers were getting ready. Alex had once again gotten to the lot just before us and joined us for the day. We didn’t have high expectations-the weather and visibility might not cooperate so we were hoping for the best. We passed 20-30 people on the Tuckerman Ravine Trail and stopped at HoJo’s to check things out. One of the rangers gave us a breakdown of conditions and we made our way up through little headwall to the Bowl. There was a decent crowd already in the bowl, mostly spectators and race volunteers, but a few people were starting to work their way up the right side of the ravine. We went up Left Gully and found the snow to be pretty stable for the most part. We let Alex set the booter because he has more energy than a Cocker Spaniel on methamphetamines. By the time we got to the top we were completely fogged in and couldn’t see more than 50 feet in front of us. We skied down left and then we were able to watch some of the first Inferno racers coming up the course. We made a good show of heckling Andrew Drummond as he finished up the hike to transition to skiing but I think he was too tired to hear us. The old grey snow made for the best skiing. Can’t beat the views up there. We wanted to ski Chute but there was no way I was dropping into it without being able to see through the fog. So we booted up and waited at the top to see if the clouds might clear long enough for us to drop. And they did! The skies cleared for a few minutes and we were able to ski down. Alex and Andy made quick work of it and I picked my way down. It was a strange combo of firmer old snow and very soft, heavy new snow. I don’t know if I’ll ever get past the sense of doom skiing over the roll on the upper part of the headwall. It’s just so steep. At this point the skies were starting to clear more consistently so we went back up Left Gully and skied down Center Headwall. I was concerned about navigating the old crown line that was left from several weeks ago but it proved to be a non-issue. Just an easy traverse across a small gap in the snow. We still had some gas left in the tank so we skied down test slope and over to Hillman’s Highway. Duchess looked like it had plenty of older snow exposed so we decided to have a go at it. We made the never ending slog up Hillman’s with a couple of Alex’s friends that were out for a ski and then traversed over to the top of Duchess. I thought the top of the headwall was intimidating but Duchess is a whole nother thing. You sit up on some rocks and the cliff just disappears below you. But I got it together and made my way down in my typical slow and cautious fashion. The choke in the center of the run had some shrubs starting to poke through but they were easy enough for me to navigate. It was an awesome day with unexpectedly good weather and snow. I was able to pick off three new lines in Tucks: Chute, Center Headwall and Duchess. Hopefully next week Andy and I will be able to ski Dodge’s Drop. There is so much snow on Mount Washington. Raymonds Cataract is filled top to bottom. It’s even possible to thread together a full ski from Lion’s Head rock. John starting to cut over from Lion’s Head Winter Trail. Normally there’s a forest here. I’ve tried to get out skiing with John for a while. It seemed our schedules never quite meshed up. But this past Wednesday we made it happen. John set a new standard for ski partners. What he lacked in speed on the ascent and transitions he made up for with in other ways. He picked me up at my house; I didn’t have to drive at all. Then he stopped by my house a couple days later with a selection of fine beers to sample. Pretty exceptional. 5 stars. My plan for the day was to boot up Hillman’s Highway and drop into Oakes Gulf again. 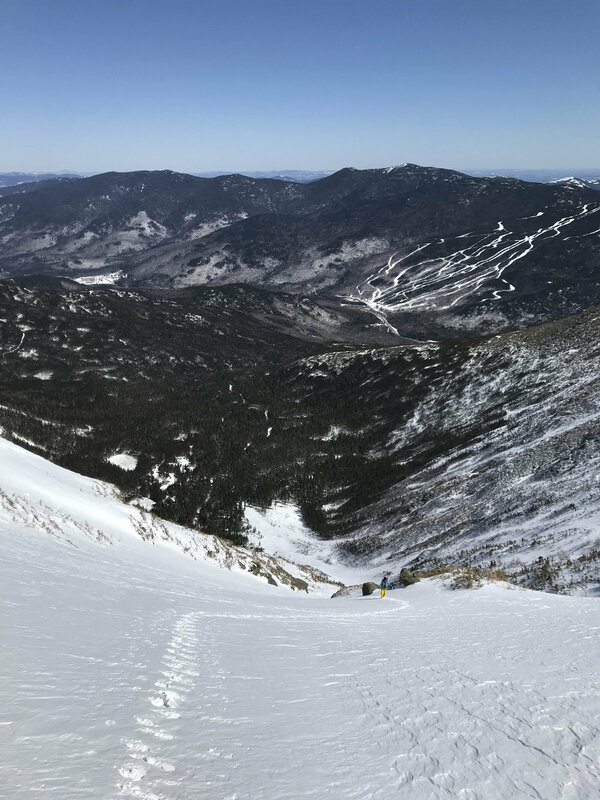 But after eying up Raymond’s Cataract from the Tuckerman Ravine Trail we decided to ski it first and figure out the rest of the day from there. Typically getting into Raymond’s Cataract is a bit of a slog. You need to enter from high up above tree line and work your way through some rocks and alpine scrub before you can start sliding on snow. But, with the amount of snow that’s in there now, you can start skiing from the Lion’s Head Winter Trail well before you hit the typical tree line. All of the small trees that would normally block your progress are completely filled in. After exiting the Lion’s Head Winter Trail we were able to skin up to about 4800 feet. The snow was super firm with some sheets of crust poking through in places. We started out skiing very hard sastrugi before it evened out into firm windslab. John took a little fall in the sastrugi because he forgot to tighten up his boots but he quickly got into a groove doing telemark jumps turns through the steeper sections. After a long section of moderate open bowl skiing the Cataract chokes down and you get to what is normally a frozen waterfall. In most years you’d need to skirt around to the side through shrubs. But on this day it was just a steep pitch of snow that was super fun. The cataract keeps choking down and then you get to the bottom of the drainage. Here we had to make our way to tight trees and deeper snow. Nothing too terrible but it wasn’t great. Luckily, it ended pretty quickly and we popped right back out onto the Huntington fire road. Just before the roll. It was steep! John making some nice turns on super firm snow. Looking back on the booter I had to reset. It took a lot of work punching through slab. Telemark jump turns. And I thought I was tired. A fine day on Mount Washington. It was great to make some fun turns in new terrain that was in spectacular condition. We filled up the rest of the day with a great run down Hillman’s Highway and the lower snowfields to the Sherburne trail. Even the long ski out on the Ammonoosuc Ravine Trail was fun and we were able to make it all the way back to the lot by skiing on the side of the road. While people were getting skunked in Tuckerman Ravine we found what were probably some of the best turns on the mountain. Keith wanted to ski. Conditions in Tuckerman Ravine sounded like they were going to be bulletproof and it was going to be stupidly cold. Keith showed interest in going somewhere outside of the Conway/Randolph bubble that he lives in. So we went on an adventure to Arrow Slide on North Hancock. With the backcountry filling in well it’s time to start getting in some more vertical each day I’m able to get out. I’ve now knocked out 76,000 feet of uphill on my skis this season; well on my way to my goal of 100,000 feet. While my goal of hitting 100k is not only in reach, but ready to be surpassed, my secondary goal of putting in bigger days in the backcountry linking up multiple ravines is on my mind. Time to put int he work to get ready. We were on the hunt for pow. The car thermometer read -9 degrees at the end of Breezy Point Road. The Salomon MTN S3 poles are great, lightweight, fully-featured touring poles at a reasonable price. They have some key feature like the safety straps and wobbly baskets that set them apart from other poles on the market. Highly recommended. Windslab, arctic temperatures, an early start, a long drive. Years ago this would have been enough to keep me from skiing. Today, I’m very happy it didn’t. We respect your privacy. We hate getting spammed, too. We will not sell or share your information with any 3rd parties. We won’t email you more than once a week, tops. We will give you an easy, no-questions-asked way to unsubscribe at any time.